Nic Nabuurs makes a toe save during Friday's game against the Picton Pirates. Photo by Adam Prudhomme. 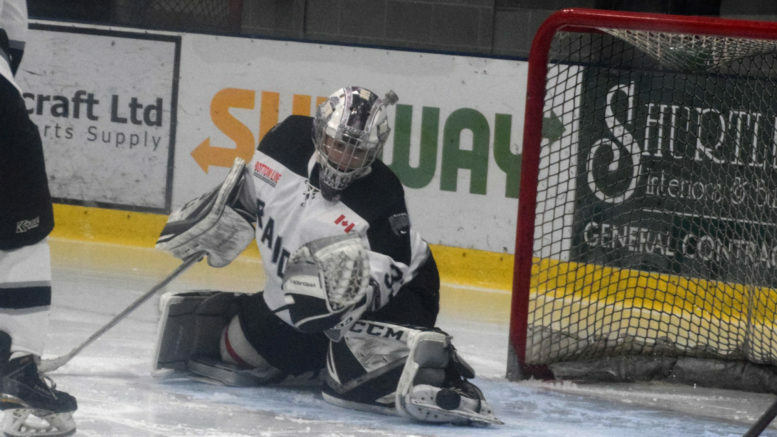 The Napanee Raiders had to put in a little overtime work Saturday in Lakefield, squeaking out a 3-2 victory and pushing their unbeaten streak to 19. One night prior at home against the Picton Pirates it was a little less dramatic as Napanee cruised to a 7-2 victory to further widen the gap between themselves and the second place Pirates in the Tod Division. Evan Foley played the hero role in Saturday’s triumph over the Chiefs, potting the game winner 1:22 into the extra frame, a power-play goal assisted by Cameron Harris and Ryan Casselman. That goal turned a potential heart-breaker into jubilation for the visitors, as Lakefield’s Zac Treen had scored a power-play goal of his own in the final minute of the third period to send the game into overtime. Both teams were evenly matched through regulation, with neither side holding a lead for very long. Cole Robbins opened the scoring for the defending Schmalz Cup champions 6:54 into the first, only to see Cullen Hinds respond for Napanee with a power-play goal just over five minutes later. Foley and Harris assisted. That 1-1 score held deep into the third when Austin Labelle knocked in a short-handed goal with less than two minutes to go in the game. Bailey Matthews and Cameron Sheehy assisted on what appeared as though may stand as the game winner. Lakefield had other ideas however, tying the game just over a minute later to set up the overtime. Bailey Maracle earned the win, stopping 22 of 24 shots by Chief skaters. Andrew Barwinski took the loss, stopping 23 of 26. Napanee scored on two of their five power-plays while the Chiefs converted on one of their four. With the win the Raiders have now swept their regular season meeting with the Orr Division’s second place Chiefs. On Friday the Raiders displayed just how far ahead they are than the rest of their own division, easily handling the second place Pirates. The Raiders got off to a quick start, building a 4-1 lead after the first period thanks to goals from Reid Humphrey, Foley, Curtis Marrison and Casselman. Former Raider Griffen Conger scored for the visitors, cutting the lead to 2-1 at the time. Conger was at it again to open the second, scoring on a power-play just 30 seconds into the middle frame. That was all the scoring the Pirates could muster however as Brodie Maracle, Justyn Steven and Labelle each tacked on a goal to round out the scoring. Though the Raiders were in control throughout the game, an unusual display of undisciplined play continued to give the Pirates a ray of hope of a comeback. All told the Raiders were charged with 47 minutes worth of penalties on 12 infractions, which translated to seven Pirate power-plays and a handful on 5-on-3s. Fortunately for Napanee goalie Nicholas Nabuurs was on his game, stopping 39 shots for the win. It was his ninth straight win and ninth straight instance of allowing two goals or fewer. Brennan Bush took the loss for Picton. With the two weekend wins the Raiders are now 20-1-0-1 at the midway mark of the 44 game season. They extended their lead over the 16-8-0-1 Pirates to eight points (41-33), while holding three games in hand over Picton. Amherstview sits third at 11-10-2 (24 points) ahead of Gananoque 7-14-1-1 (16), Port Hope 6-16-0-1 (13) while Campbellford sits last at 1-22-0-1 (3). Napanee opens the second half of the season Friday night when the Gananoque Islanders come to the SPC for a 7:30 p.m. puck drop. On Saturday they visit Campbellford.